November 25 sees the release Twelve Twenty Seven, the new EP from Meteor-nominated Irish band Susie Soho (the Meteors are Ireland's equivalent of the Brit Awards). The alternative-rock four piece – whose members have opened for and shared the stage with artists such as Damien Rice, The Frames, Mundy, and Damien Dempsey – are also doing a series of live performances around the country this Autumn to promote the release. Featuring Jason Maher on bass, Niall Campion on guitar and Mia Fitzgerald on drums, Susie Soho was formed by singer and guitarist Tony Fitz in 2009. 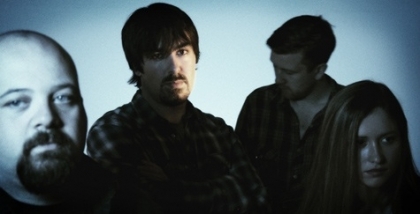 Describing themselves as “the kind of band you’d get if Dave Grohl and Gemma Hayes had some kind of musical lovechild”, their catchy, guitar-driven songs blend a distinctively Irish sound with US-tinged alternative rock. Twelve Twenty Seven was recorded at Windmill Lane studios and features four songs. The EP’s themes range from the personal (Your Way Or Not At All; An Eye for an Eye) to the political (Stand Up, which was released as a single in the run up to the last Irish general election), with one track taking cynics to task along the way (Making Taste). Susie Soho’s EP features melodies you can’t shake from your head, driving guitar riffs and a punchy, in-your-face alternative rock sound. With these excellent tracks in the can, and new material on the way, they are a band to definitely keep an eye on. The band name comes from the the title of the 2000 jazz album “Good Morning Susie Soho” by the Esbjorn Svensson Trio. Tony Fitz got physics lessons from Dominic of Bellx1, back when Bellx1 and Damien Rice were still Juniper. One thing led to another and Tony ended up opening shows and playing lead guitar for Damien Rice. Tony has also played with The Frames, and with the late Mic Christopher. It was a great honour for Tony to later be asked by Mic's family to perform at the launch of his album a year after his death, and a New Year’s Eve special performance on RTE in his memory. The band have worked in classic studios such as Abbey Road, London and Windmill Lane, Dublin and are obsessed with studio gear and obscure recording equipment. The EP’s Stand Up track (a recent single) was written as both a commentary on the causes of the anger and frustration that people all over Ireland were feeling in the final days of the last government, when things were looking more and more bleak, and as a call for people to get involved in the process of turning the country around. Niall has worked professionally in film and television graphics for many years. As well as working on high profile graphics jobs for RTE and the BBC, he has also edited a number of film projects, including Domhnall Gleeson’s hugely successful short "Noreen". In addition to directing videos for the band's own music, Niall has made videos for Damien Rice, Frank and Walters, Hybrasil, Bellx1 and Saso. For more information about Susie Soho, please see www.susiesoho.com.